When it comes to buying homes in lifestyle estates, the pricing of the homes in these usually tie in with the higher standard of living that a so-called “lifestyle estate” offers, but at Sharon Park Lifestyle Estate, says Gavin Vickers, managing director of Kairos, the company which is mandated to market the homes at Sharon Park, the developers, Hlala Kamnandi Developments, are building what they promise they will build at prices that are all inclusive and are truly in the affordable market segment. Sharon Park is situated between Springs and Nigel, on the East Rand, and the demand outstrips supply of homes in the affordable bracket in this area. 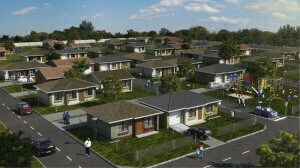 There are 400 existing homes on this site, from a previous development that struggled in the slump of 2008, but Hlala Kamnandi Developments recently took over the remaining land and will be adding 1 300 full title freestanding homes to the development. The prices of these are from R305 000 for two bedroom 44m² homes to R429 000 for the largest, which is 82m² with three bedrooms and two bathrooms, as well as a garage. The homes here will have all the finishes one would find in a standard new home, fitted countertops and cupboards and bathroom and kitchen fixtures, says Vickers, which differs from many other affordable developments where the buyer usually gets a basic “shell” which he pays extra to kit out with the finishes of his choice. The living areas will be tiled, bedrooms carpeted and the garden’s lawn and home security is included in the price, which is virtually unheard of, says Vickers. The main focus at Sharon Park, he says, will be providing a quality home and educating the public about the importance of property ownership and buying their own homes. At Sharon Park, said Vickers, there are seven house plans available which provide a north and south street orientation to maximise the use of natural light. These have a choice of four different external finishes and two different roof types, which ultimately gives the buyer 56 different architectural styles from which to choose. “The feel of this estate will be upmarket, with a family orientated lifestyle of security and safety provided by a fully walled estate with guarded entrance and exit points and electric fencing around the entire estate,” said Vickers. There is a three year plan at Sharon Park, where 350 homes will be built this year, 350 next year and the balance in 2015, said Vickers, “which is ambitious and exciting”. SIMS will help a great deal in managing the sales and progress of sales of these units efficiently. Kairos is enlisting the help of local people in the sales and administration and, by involving the community, hope to create new opportunities and integration into new careers, said Vickers. “Selling homes in the affordable sector doesn’t end with selling the home,” he said. “It usually comes with educating buyers, assisting later with management or implementation of the HOA or body corporate and then education on maintaining value of the properties, which we aim to do here,” he said.